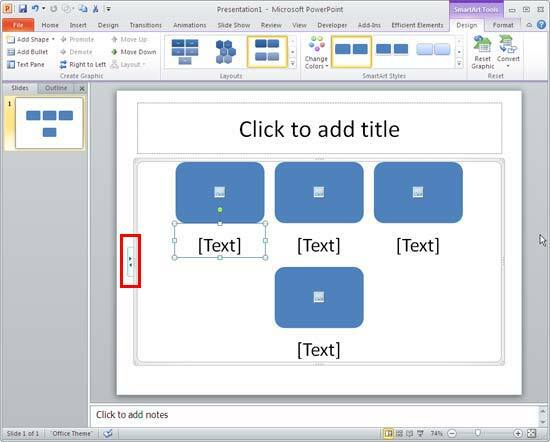 Excerpt/Capsule: Learn how to insert SmartArt graphics in PowerPoint 2010. 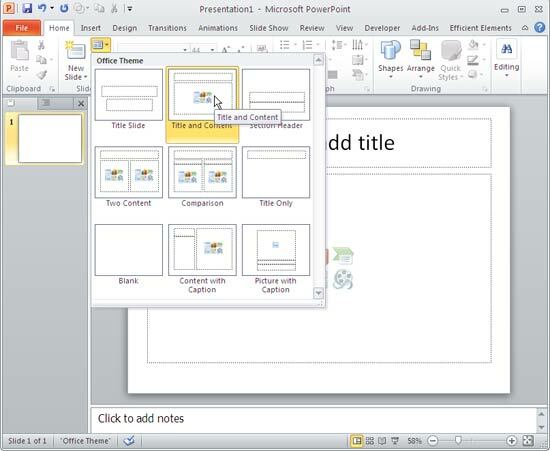 SmartArt in PowerPoint 2007and 2010 has replaced the diagram options in previous versions of PowerPoint. SmartArt also allows you to replace bullet points with info-graphic content using text-within-shapes that's more logical to view and present. 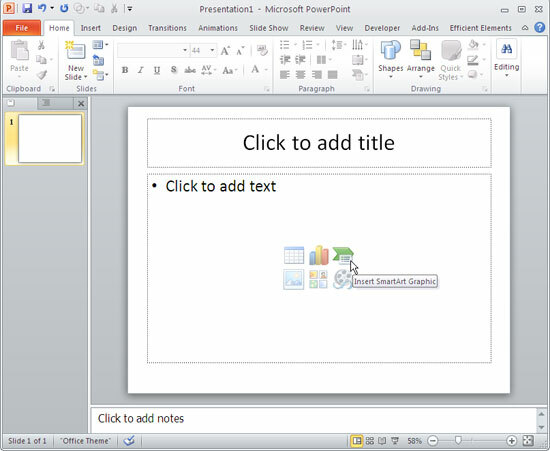 In this tutorial you'll learn how to insert a SmartArt graphics within PowerPoint 2010. If you are new to this, do also take a look at the What is SmartArt? and SmartArt Samples pages. 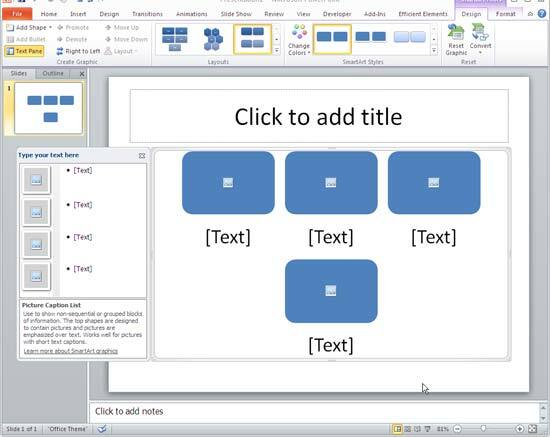 Note: Learn how to insert a new slide in PowerPoint 2010 and how to change the slide layout in PowerPoint 2010. 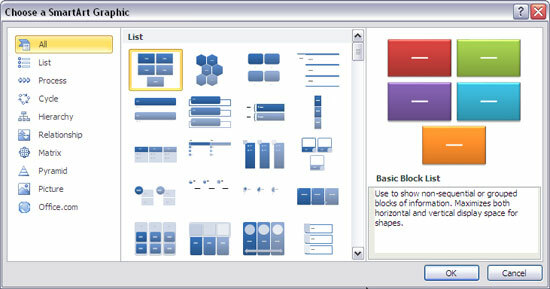 Click the Layout button/option in the Home tab of the Ribbon to bring up the Layout gallery as shown in Figure 1. Select any of the layouts that include a content placeholder (the small palette like collection of multicolored buttons visible on some of the slide layouts (see Figure 1 again). If your slide layout has a content placeholder, click the Insert SmartArt Graphic button among the six buttons in the content placeholder that you can see in the slide within Figure 2. The left pane lists the types of SmartArt graphics available -- the middle area displays SmartArt graphic variants within the selected type, and the area towards the right shows a preview of the selected SmartArt graphic along with a brief description. When the SmartArt graphic is placed on the slide, click the arrows located on the left side (highlighted in red in Figure 5 above) to open the text pane (see Figure 6). Any text content added or edited within the text pane shows up within the SmartArt graphic as well.